The need for recreation and active relaxation is as real in space as it is on Earth, and the creativity required to adapt games to the special demands of this environment is perhaps part of the fun. ‘What three things would I take with me to Mars? A deck of cards, my wedding ring, and my Looney Pyramids,’ states Dr Leila Zucker on her personal website. Zucker, an ER physician based in Washington DC, is an avid game player who is among the 100 remaining candidates currently being considered for the Mars One Mission. A private enterprise set up by Dutch entrepreneur Bas Lansdorp, Mars One aims to establish the first permanent human colony on the Red Planet by 2032 (see WTW Issue 4). During the seven-month trip to Mars, participants will have to amuse themselves. 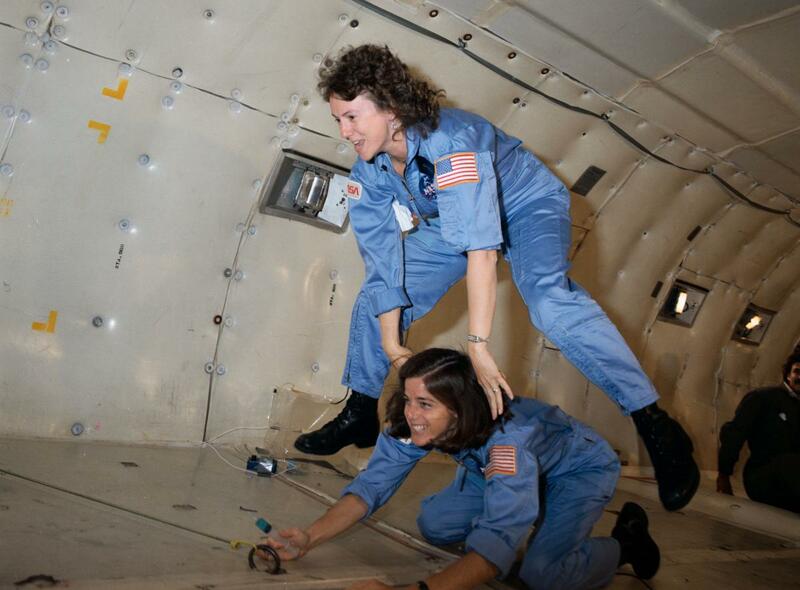 Fortunately, with a little creativity, play is as possible as it is critical in space. The need for recreation and active relaxation is as real in space as it is on Earth. The creativity required to adapt games to the special demands of this environment is perhaps part of the fun. The Looney Pyramids, a set of lightweight, stackable styrene pyramids,, and a deck of cards would allow Zucker to play over 500 games varying from simple to complex, short to long. ‘Playing games in space, especially with pyramids, literally opens up a whole new dimension,’ she says. ‘Imagine playing a game where your pieces were arranged not in 2‑D but in 3‑D.’ Such complexity and novelty will be sorely needed on the mission since candidates who make the final selection get a one-way ticket to Mars, leaving their home planet for good. ‘There’s nothing better than sitting around with your friends and playing a game. A good game is visually appealing. There is a visceral feeling to holding a piece in your hands,’ says Andrew Looney, Chief Creative Officer of Looney Labs, and inventor of the Looney Pyramids. ‘You should be able to play a game anytime, anywhere.’ A former NASA employee, he’s confident that his games would work on Mars, whose gravitational pull is only 38% of Earth’s. Looney compares game design to coding for the Hubble Space Telescope. ‘In my previous life as an aerospace engineer, I wrote a lot of code. I find that writing software is a similar process to writing game rules. You try and get rid of all potential errors.’ One discipline that helps him work out these details is to describe new games to his company in the form of a design memo. ‘Nothing forces you to think through an idea like writing it down,’ he says. All games balance prescribed goals with an element of chance, an uncertainty that the goals will be reached. In this, they are remarkably like space travel, and the longer the mission, the greater the uncertainty. ‘Most of our current missions to the International Space Station are six months to a year, so we don’t have enough data about astronauts’ health on longer missions,’ says Dr Raffi Kuyumjian, Chief Medical Officer of the Canadian Space Agency’s operational space medicine programme, who monitors the astronauts’ vital statistics to understand how they change in space, and to help them stay healthy before, during and after their missions. But in addition to the physiological effects of long-term space travel, there are psychological ones, including the stress caused by isolation, by knowing that your every action is being recorded, and by separation from loved ones. ‘When space missions were shorter, astronauts were selected purely for their technical skills, but over the course of many missions, we’ve learned that the space station is a closed environment with many different cultures,’ says Kuyumjian. Selecting a team of astronauts is not a matter of choosing people who are instantly compatible, but of choosing team players who can learn to work and grow together in a challenging environment. On December 28, 1973 three American astronauts at NASA’s Skylab, Jerry Carr, Ed Gibson, and William Pogue, felt so fatigued by their 16-hour workdays that they staged a one-day strike. Their protest, in which they cut off communication with ground control and spent the day relaxing, set a precedent for future missions to recognise the importance of downtime. ‘We learned from early research that [astronauts] needed the ability to call family and not be overworked. They have a regular work week, and aside from a few clean-up chores, they have weekends off,’ says Kuyumjian. 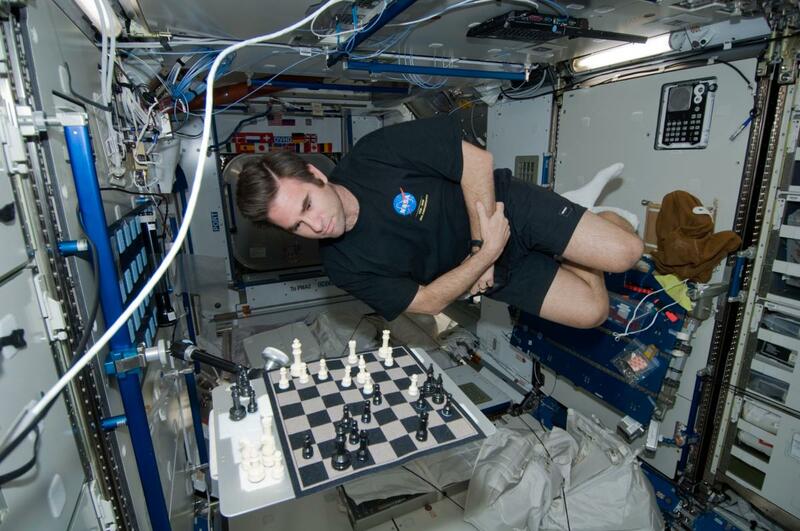 Chess was part of life on the ISS in both 2008 and 2011, when astronauts Greg Chamitoff and Greg Johnson played an ‘interplanetary space game’ against earthlings who could suggest countermoves in a game facilitated by the United States Chess Federation. 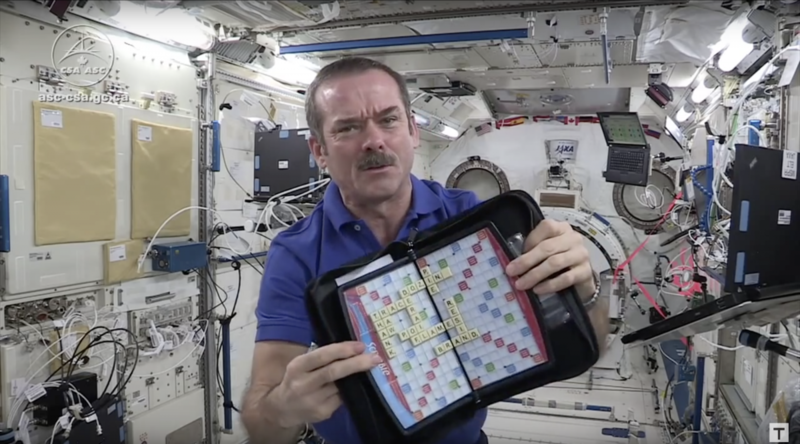 As for Scrabble, Canadian astronaut Chris Hadfield left Earth with a travel-sized set. Each tiny letter tile had a Velcro backing so it could be affixed to the board, which was hung in the mess area. In the zero-gravity environment of the ISS, the pieces need to be secured or they would float away, though lost pieces could usually be found relatively easily, not on a floor or under a couch as on Earth, but in the space station’s air filters. Hadfield also developed space darts, adapting the popular bar game to a microgravity environment where sharp objects could not be thrown. His dart had a heavy camera battery for a nose, two zip-ties for a shaft, and notepaper for fletching. As ungainly as they may look, space darts drift gracefully from one end of the cabin to the other when thrown, quite unlike their planetside counterparts. Leanne Prain is a writer and designer who lives and works in Vancouver, Canada. She hopes one day she’ll see crokinole, her favourite game, played in space. This article comes from Works That Work magazine, No.9.